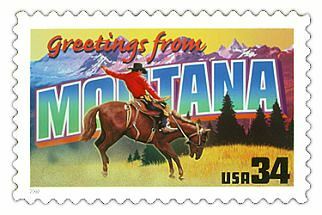 Where My Heart Lives...: Montana --- Where Are You? My blog is still in her infancy. She just turned 100 posts old yesterday (in 'people years' that would be 9 months.) During that time I've had the pleasure of meeting many of you, readers now, who've become friends from afar. You've come from all over the United States (howdy Linda, Penni, Breathe, Joni, Spruce Hill, April, Nancy and my hero - Starla!). Central and South America (hi Sonia! ), the United Kingdom (hey Sara!). G'day to my friends in Oz and New Zealand. Amazingly, I had a ship off the coast of Nigeria reading for awhile --- welcome! But, where oh where is MONTANA? I'd love to hear from you, people of the "Last Best Place"! Warm up those laptops, drop me a line, add a comment to my blog and let ME know YOU know I'm here. I miss you, your huge state-ly-ness and your wide open spaces. Give it a go, git 'er done! Well, hello from New Mexico in any case! Love your blog!